The Royal BC Museum, with permission. At first sight, barnacles look like slight projections of the rocks on which they grow, but closer inspection will show that each contains a well developed animal which is wonderfully adapted to its mode of life. There is not just one kind of barnacle, as a casual observer might think, but there are four or five hundred kinds, or species, in the world. Some of them have taken strange places in which to live: one species is found only on the tongue of a certain turtle; another bores holes in soft rock; one species has developed a float; several species are found only in very deep water. Others are found only between high- and low-tide marks, where they grow in such profusion that they appear to be the dominant group of living things in this zone. Still others live mostly embedded in the skin of whales or attached to the tip of the whale's flipper. Others again (e.g. Saculina) are whollly parasitic, living upon crabs of several species. These last are degenerate forms, however, and are not included in this booklet. The question arises: What is a barnacle? Simply answered, a barnacle or cirriped is a crustacean, a relative of the crab, lobster and sand-flea, that has attached itself permanently to some object larger than itself. A shell has developed in which it lives, and its legs have become modified into most efficient sweeps for the capture of the small sea-creatures and organic material on which it feeds. If a barnacle is examined, it will be seen that the opening at the summit of the shell is closed by four movable plates hinged like folding doors. When these are opened, the sweep may be protruded; when they are closed, the barnacle is protected from enemies and from drying when exposed to the air. When one walks over rocks at low tide, a slight grating or bubbling noise may be heard. This is caused by the barnacles closing their doors more tightly, an action which may be induced even by the passing of a shadow. Except in the case of groups such as "acorn barnacles", "goose barnacles", and "whale barnacles", these creatures do not have common or vernacular names. It is necessary therefore to use scientific names for the various species. There are two divisions of the barnacles or "Cirripedia", namely the acorn or "sessile", and the goose or "pedunculate". In both of these, the internal anatomy is much the same, but their outside appearance is very different. The sessile barnacles have calcareous shells fixed directly to some support, while the pedunculate barnacles have the body-chamber, or "capitulum" on the end of a flexible stem, the "peduncle". The peduncle, in turn, may be fixed to a floating object, or, in one case, to a float produced by the cement gland. Certain sessile barnacles are to be found on whales, and these are known by the general term 'whale barnacle'. However, two species of the pedunculate barnacle Conchoderma are commonly found attached to certain whale barnacles, and these are often called whale barnacles for convenience. The number of plates forming the shell of the different genera of sessile barnacles varies from eight in Catophragmus (Bermuda, Hawaiian Islands, and New South Wales) to one in Pyrgoma (West Indies), in which all of the plates are fused together to form a solid ring. On the British Columbia coast, there are only two genera of sessile barnacles--Balanus and Chthamalus. They each have six triangular plates forming the conical shell, but the arrangement of the plates differ. In some sessile barnacles, the plates forming the wall are solid. In others, they are double, being formed by the inner and outer 'lamina', the space between them being filled by the 'parietal' tubes. These tubes run from the 'basal' part of the plates to the 'apex', and in several species they have 'cross septa' dividing the tubes into a series of cells. The 'base' or 'basis' is the part of the shell that is attached to its support, really the floor of the shell. Only one British Columbia species (Balanus cariosus) has a membranous base, consisting of a simple membrane made up of concentric rings that are added to the periphery at each period of growth. All the other species of this coast have calcareous bases. Some are very thin, and will adhere to their support firmly. In collecting, it will often be found that the shell will break around the lower edge, thus leaving the base attached to the support. The bases of some barnacles, such as Balanus nubilus, are very thick and are permeated by pores similar to the parietal tubes in the walls. The thickened part of the shell around the interior of the 'orifice is called the 'sheath'. It is composed of fine shelly layers which become deeper as the shell grows. Attached to the sheath a little above its lower margin is the 'opercular membrane', which acts as a cover for the orifice. An opening in the centre permits the 'crri' to be protruded during times of feeding. On each side of the opening are two pairs of calcareous cover-plates named the 'scuta' and 'terga'. Within the shell the body is enclosed in a 'mantle', a membranous organ which secretes the limy material of which the shell is made. The animal lies on its back with the cirri pointing up directly under the opening of the operculum, through which they are thrust when in search of food. The cirri are composed of six pairs of legs; each leg has two branches made up of many segments, and each segment has a double row of spines on the inner face forming a very efficient net. Food is carried directly to the mouth, which is situated on a prominence near the middle of the body. The barnacle has no heart or circulating system as found in higher animals. Body fluids flow through passages among the muscles and other organs in a 'lucunar' circulation. Barnacles have a well-developed nervous system, that of the pedunculate species being arranged in a ladder-like manner very similar to that of the primitive crustaceans, from which barnacles undoubtedly were drived (Cornwall,1953). In the sessile barnacles the nervous system is much more centralized, the ladder-like arrangement being concentrated into one large 'ganglion', from which the nerves to the appendages radiate. Simple eyes are present beneath the skin of the 'prosoma', the bag-like portion of the body which corresponds to the head. The eyes are sensitive to light; the shadow of a hand passing over barnacles in a tide pool will cause them to close their cover-lates. The body chamber or capitulum of pedunculate barnacles is protected by a series of calcareous plates. In Lepas there are five such plates--paired scuta and terga and a single 'carina', corresponding to the cover-plates in sessile forms. Additonal lateral plates or rows of scales may be present in members of other genera and scales may also be present on the peduncle. In some species the peduncle is provided with three layers of muscles--longitudinal, transverse, and oblique--that give it the power of motion. Several cement glands at the base of the peduncle fasten the animal to its support. At intervals throughout life a barnacle casts off its old skin and replaced it with a larger one to allow for growth. In the larval stages this mouting takes place several times, sometimes in rapid succession; in the adult stage it is less frequent, the intervals of time depending upon the rate of growth. In the process the entire chitinous covering of the body, together wiht the covering of the branched cirri and other appendages, is casdt off in one piece, as is the case with the other members of this class. For some unknown reason moulting seems to take place simultaneously over a large area; many moults are often to be seen at one time floating in the sea. The shell of the barnacle is beautifully deigned for the protection of the enclosed body, and yet exhibits almost unlimited range of variation--which makes determination of species very difficult. It cannot be too strongly emphasized that identification should not rely on external characteristics. Even after long experience with barnacles from all parts of the world, an expert may have difficulty in naming several species common to this coast without dissecting them. There is one species common on the coast of British Columbia that would certainly be divided into several species if judged from extenal appearance alone. This is Balanus cariosus, the barnacle that is found in great numbers between high- and low-tide marks. Occasionally an individual will be found growing alone and uncrowded; under such conditions the shell will assume its normal shape, a steep-walled cone with a jagged irregular opening at the top. The walls are covered with many downward-pointing spines, giving what Darwin called a 'thatched appearance'. The walls are thick, and are permeated by many pores. When crowded, this barnacle assume quite a different form, as the plates forming the wall are then much elongated and show no trace of the thatched appearance. When the barnacle grows on a restricted surface, such as a pebble, it takes the form in which the walls are thick and rough and may or may not have the thatched appearance. When this species grows on a rock where it is exposed to erosion caused by wave-action and water-borne materials, it looks different again. The walls coalesce, and are worn down nearly as fast as they grow. The cover-plates, however, are not eroded, as they are not firmly fixed as the walls are. As a consequence, they often tend to project above the level of the walls. The largest barnacle found on this coast, Balanus nubilus, gains rooms, when crowded, by deepening its base, which often becomes a cornucopia-shaped cup that may reach a lenght of six inches. The shell does not vary in shape, but its external sculpturing can rarely be seen as it is usually much eroded. Erosion, or wearing away of the shell, is worthy of note in the study of barnacles, since some species are very subject to it, while others seem to have developed an immunity to it. For example, a full-grown specimen of Balanus nubilus or B. cariosus is rarely seen without some evidence of erosion, while B. rostratus almost always has a perfect shell. "Not only does every external character vary greatly in most species, but the non-internal parts very often vary to a surprising degree; and to add to the difficulty, groups of specimens not rarely vary in the same manner". Barnacles are hermaphrodites; that is, both male and female reproductive organs are present in each individual. However, members of some genera, such as Ibla (found in the Phillippines and Australia) and Scalpellum (found world-wide) have what is called a "complemental male", which bears about the same size proportion to the barnacle as a mouse does to a man. Complemental males vary in structure; some have no mouths or stomachs, and must be very short-lived. In all species, the eggs are retained in two sacs, called the "ovigerous lamellae", in which they are held together in layers by a delicate transparent membrane. When the young first emerge from the egg, they are in the "napulius" or free-swimming stage....At certain seasons of the year these young may be seen drifting like clouds through the sea. Larvae increase in size by a series of "moults" until they reach the "metanauplius" stage, during which they change in form and their single eye becomes two. By the end of the next moult, a bivalve shell has developed, additional appendages appear, and globules of fat form in the body to provide buoyancy. After a period of some days, this "cypris" larvae" settels on a solid object to which it becomes attached by the "antennules", assisted by secretions from the cement glands. The bivalve shell is now lost, the body becomes greatly changed in form, and the valves of the adult shell appear. For the rest of its life, the barnacle remains fixed in this position literally "standon on its head and kicking food into its mouth with its feet". It is easy to tell at sight to which of the two great groups a barnacle belongs. If it has a more or less flexible stem, it is a pedunculate barnacle. If the shell is attached to a support in such a way that it cannot move, it is a sessile or acorn barnacle. 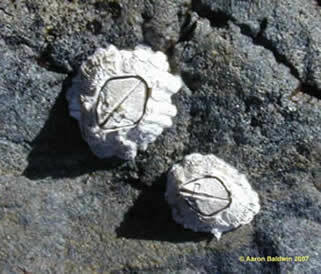 Whale barnacles are acorn barnacles specially modified for attachment to whales. The pedunculate species found on the coast of British Columbia are divided among four genera. They are readily identified by use of the key and reference to the figures and accompanying text. It is a little more difficult to identify an acorn or sessile barnacle as the outside appearance alone is not a reliable guide. However, the internal sculpture of the cover plates appears to be fairly constant and can be used in the identification of most species. However, it is not safe to rely alone on the sculpture of the cover-plates for identification as there are species with plates that look nearly the same. Therefore, several other characters must be taken into consideration. The number of spines on the middle segment of the sixth leg; the shape of the mouth parts; and the structure of the base of the shell. An examination of mouth parts must be done if a correct determination of the species is required, and this is rather difficult to do if the specimen is a small one like Chthamalus. Since in some of these a full grown specimen is only 4 or 5 millimetres in diameter, the mouth parts can be seen only under a magnifying glass. Barnard, K. H. 1924. Cirripedia. Annals of the South African Museum. Vol. 20. Broch, H. J. 1914-1916. Papers from Dr. Th. Mortensen's Pacific Expedition. 1914-1916. Broch, H. J. Saertrk af Vidensk Medd. Fra Dansk naturh. Foren. Bd. 91. Odense. Cornwall, Ira E. 1924. Some Littoral Barnacles from William Head, British Columbia. Canadian Field-Naturalist. 38 (3): 41-43. Cornwall, Ira E. 1924 (a). Notes on the West Coast Whale Barnacles. Proceedings of the California Academy of Sciences, Series 4, Vol. 13, No. 26. pp 421-431. Cornwall, Ira E. 1927. Some North Pacific Whale Barnacles. Contributions to Canadian Biology and Fisheries. New Series, Vol. 3, No. 23, No. 23, pp. 503-517. Cornwall, Ira E. 1928. Collecting at Cachalot Whaling Station. Canadian Field-Naturalist. 42 (1) 9-12. Cornwall, Ira E. 1930. A Banracle (Scalpellum columbianum) from Departure Bay, British Columbia. Contributions to Canadian Biology and Fisheries. 5 (9): 215-217. Cornwall, Ira E. 1936. On the Nervous System of Four British Columbia Barnacles (One New Species). Journal of the Biological Board of Canada. 1(6): 469-475. Cornwall, Ira E. 1951. The Barnacles of California (Cirripedia). Wasmann Journal of Biology 9(3): 311-346. Cornwall, Ira E. 1955. Arthropoda: Ciripedia. Canadian Pacific Fauna Series, Fisheries Research Board of Canada. In press. Darwin, Charles. 1851. A Monograph on the Sub-class Cirripedia. Pedunculate Barnacles. Ray Society, London, England. Darwin, Charles. 1954. A Monograph on the Sub-class Cirripedia. Sessile Barnacles. Ray Society, London, England. Gruvel, A. 1904. Monographic des Cirrhipedes au Thecostraces. Libraires de L'Academie de Medicine, Paris. Henry, Dora P. 1940 a. Notes on Some Pedunculate Barnacles from the Pacific Coast. Proceedings of the U.S. National Museum 88(3081): 225-236. Henry, Dora P. 1940 b. The Cirripedia of Puget Sound with Key to the Species. University of Washington Publications in Oceanography. 4(1): 1-48. Henry, Dora P. 1941. Notes on Some Sessile Barnacles from Lower California and the West Coast of Mexico. Proceedings of the New England Zoological Club18: 99-106. Henry, Dora P. 1942. Studies on the Sessile Cirripedia of the Pacific Coast of North America. University of Washington Publications in Oceanography 4(3): 95-134. Hiro, Fuji. 1935. The Fauna of Akkeshi Bay. Cirripedia. Hokkaido Imperial University. Series 6, No. 4. Hiro, Fuji. 1937. Studies on the Cirripedians Fauna of Japan. Memoirs of the College of Science, Kyoto Imperial University. Series B, Vol. 12. Hoek, P. P. C. 1883. Report on the Cirripedia. Challenger Reports, Zoology, Vol. 8. Margolis, L. 1954. List of the Parasites Recorded from Sea Mammals Caught off the West Coast of North America. Journal of the Fisheries Research Board of Canada. 11(3): 267-283. Pilsbry, H. A. 1907. The Barnacles (Cirrepidia) Contained in the Collections of the U.S. National Museum. U.S. National Museum Bulletin. 60: 1-222. Pilsbry, H. A. 1909. A New Species of Scalpellum from British Columbia. Proceedings of the Academy of Sciences in Philadelphia 61: 367-368. Pilsbry, H. A. 1916. The Sessile Barnacles (Cirripedia) Contained in the Collections of the U.Sl. National Museum; Including a Monagraph of the American Species. U.S. National Museum Bulletin 93: 1-366. Pilsbry, H. A. 1921. Barnacles of the San Juan Islands, Washington. Proceedings of the U.S. National Museum 59(2362): 111-115. Sheffer, Victor B. 1939. Organisms Collected from Whales in the Aleutian Islands. Murrelet 20: 67-69. Withers, T. H. 1928. Catalogue of Fossil Cirripedia in the British Museum. 1: 15, 36.